Steve Chan. Looking for Balance: China, the United States, and Power Balancing in East Asia. Stanford: Stanford University Press, 2012. ISBN: 9780804778206 (cloth, $50.00); 9780804788601 (paperback, $29.95). Steve Chan’s sophisticated book, Looking For Balance, comes down squarely on the side of the optimists. Chan argues that contemporary East Asia defies the expectations of International Relations (IR) theorists, especially so-called realists, who view the quest to achieve a balance of power as the natural order of things. Why has Asia been different? The author emphasizes the strategies that Asian elites have used to legitimize their rule. In particular, he argues that Asia’s rulers have chosen to stake their claim to legitimacy on economic development rather than nationalism, military expansion, or ideology (4). Seeking to assure the strong performance of their economies, Asian leaders have promoted a broad array of financial and economic ties between their countries. These ties constitute a “credible commitment to cooperate” and reduce the probability of militarized conflict among the states (5). Thus, while the balance of power theories advocated by realist scholars might have been reliable predictors of developments in Europe, they fail to fully take into account the specific dynamics at play in the Asia region. To make this point, Chan engages in a detailed and frequently incisive dissection of the IR literature on power balancing. He demonstrates that within this literature there are significant points of tension and conflict. Moreover, he argues that history has by no means proven that alignment against a rising power is a universal phenomenon (52). Chan then presents a wide array of data that demonstrate how his point pertains to contemporary East Asia. Interestingly, he finds that defense spending as a percentage of GDP has actually declined in most Asian states despite China’s rise while the People’s Republic of China (PRC) has occupied an increasingly important role in the trade and investment polices of its neighbors. The two reviewers, Evelyn Goh and Michael Sheng, find much to commend in Chan’s analysis and the roundtable as a whole presents few areas of serious disagreement between the author and his book’s reviewers. There is a broad consensus among the author and the reviewers on the limitations of balance-of-power theories for understanding the dynamics of the Asian region. Goh in particular praises Chan for “showing convincingly the serious limitations” of these central tenets of IR scholarship. On this point, both Chan and his reviewers lend further credence to an argument advanced over a decade ago by David C. Kang: IR theorists should stop trying to simply extrapolate concepts and theories based on the European experience to Asia. Both reviewers also praise Chan for adopting a broad multilateral perspective. Rather than focusing only on the United States and China and insisting that they are the only two important actors, Chan tries to understand the motives and policies of other key actors in the region. Chan’s book is an important reminder that while the United States and the PRC may have the world’s two largest economies, South Korea, Japan, and India, among others, are also in position to significantly influence the region’s political trajectory and play a role in whether it moves toward greater stability or conflict. While all agree that Looking for Balance improves upon the somewhat myopic view of Asian politics advanced by balance-of-power theories, the two reviewers do raise some concerns. Chan generally advances his arguments by closely reading and critiquing the work of other scholars. He does not, however, use empirical methods to test or validate his theorizing. Instead, as Evelyn Goh notes, he leaves this task to others. Chan recognizes that Looking for Balance really only constitutes a starting point for future research and agrees with Goh that other scholars should in the future try to derive more systematic ways for testing the thesis it presents. I would hope in particular that any such research would make much greater use of Asian language sources. Although Chan’s book is an extremely wide ranging one, there is not a single Asian-language source cited in the bibliography. This no doubt reflects the objectives and goals of the author, which seem to be more geared at making a contribution in the conceptual and theoretical realm. Nevertheless, any efforts to validate Chan’s arguments will, in my view, never be fully convincing unless they seek to understand the perspective of Asian nations through a much deeper engagement with Chinese, Korean, and Japanese materials. Michael Sheng’s review not only questions how Chan’s hypotheses can be validated but also raises an interrelated concern: whether or not future events will prove Chan wrong. Just because the proverbial dog has yet to bark, there is no guarantee that it will not bark in the near future. Chan’s book was originally published in 2012 and much of the research and writing was likely completed a year or two before then. Michael Sheng notes that since the book’s publication there have been numerous signs that the Chinese economy is slowing down. Such a slow-down might be troubling because the Chinese Communist Party (CCP) would no longer be able to use double-digit economic growth rates as the basis for its legitimacy. Sheng also points to the growing frictions between China and its neighbors—most notably Japan—during the last few years. Indeed, a strain of xenophobic nationalism has continued to undergird many of the PRC’s interactions with its neighbors. This was evident in Beijing’s decision to declare an Air Defense Identification Zone covering much of the East China Sea in 2013 as well as its recent island-building in the South China Sea. It is uncertain how much further the PRC can push in this direction without eventually inviting the kind of balancing behavior that realists would predict. Recently Japan and South Korea have decided to purchase 42 and 35 Lockheed Martin F-35A fighter planes respectively. Could this be a sign that the “credible commitment to cooperate” (5) described by Chan is coming to an end? Chan does not completely think so. He acknowledges that there have been some worrisome developments in Asia during the last few years. Nevertheless, he continues to see the glass as half-full and believes that the need for economic cooperation is likely to outweigh any potential benefits of militarization, balancing and conflict. I hope he proves right. Steve Chan is College Professor of Distinction at University of Colorado (Boulder). His recent research has studied international relations theorizing pertaining to the Asia Pacific and China more specifically. His recent book projects include Troubled Waters? China’s Maritime Disputes in Theoretical Perspective (under consideration at Cambridge University Press); Enduring Rivalries in the Asia Pacific (Cambridge University Press, 2013); Looking for Balance; China, the United States, and Power Balancing in East Asia (Stanford University Press, 2012); China, the U.S., and the Power-Transition Theory: A Critique (Routledge, 2008). Evelyn Goh (MA, DPhil, Oxford) is the Shedden Professor of Strategic Policy Studies at the School of International, Political and Strategic Studies of the Australian National University. Her research interests are East Asian security and international relations theory. She has published widely on U.S.-China relations and diplomatic history, regional security cooperation and institutions in East Asia, Southeast Asian strategies towards great powers, and environmental security. Her latest book is The Struggle for Order: Hegemony, Hierarchy and Transition in Post-Cold War East Asia (Oxford: Oxford University Press, 2013). She has held previous faculty positions at Royal Holloway University of London, the University of Oxford, and the Rajaratnam School of International Studies in Singapore. Michael Sheng is a professor in the Department of History at the University of Akron. His recent publications include “Mao and China’s Relations with the Superpowers in the 1950s: The Taiwan Straits Crises Revisited,” in Modern China (October 2008), and “Mao’s Role in the Korean Conflict: A Revision,” in Twentieth Century China, 39:3 (October 2014, 269–290). In the often hide-bound field of International Relations, Steve Chan leads the charge once again to push the boundaries of mainstream theorising beyond the comfortable confines of simplified realist assumptions. In keeping with his 2008 book debunking the misapplication of power transition theories to contemporary East Asia, Chan offers in this volume an equally useful dissection of the missed subtleties, misuses, and limits of power balancing theories in light of the empirical record of behaviour among regional states. His chief finding, argument, and starting point is that those looking for evidence of China’s East Asian neighbours balancing against China’s rising power will find the cupboard bare. Surveying data on military spending as a proportion of gross domestic product, two-way trade with China relative to overall trade, and deployment of U.S. military personnel in these countries , Chan demonstrates that we do not see the degree of internal arming or external security alignment behaviour we would expect to see if they were balancing against China. Furthermore, he sees the huge increase of intra-Asian trade and reorientation of this trade towards China as evidence to triangulate the claim that East Asian states do not exhibit the degree of security concerns about China we might expect. Indeed, Chan’s main argument is that the choices and behaviour of these states – often including defence expenditure and alignment – reflect motivations other than balancing. He emphasizes that paying attention to the empirical record of behaviour among East Asian states exposes two truths: first, balancing is costly and therefore not usually the de facto choice; and second, balancing is especially costly in this region because “East Asian elites have collectively pivoted to a strategy of elite legitimacy and regime survival based on economic performance rather than nationalism, military expansion, or ideological propagation” (4). The book’s slightly convoluted thesis centres on three aims and answers. First, Chan quite rightly seeks to explain more satisfactorily than others have how the traditional security relationships in East Asia are related to the increasingly dominant economic phenomena. He explicitly links the post-1945 U.S. bargain with regional allies and partners – exchanging security guarantees and market access for political support and subordination – with facilitating the domestic political bargains within these countries in favour of internationalist outlooks prioritizing economic growth. He performs an important service in fleshing out this economic-security nexus by elaborating on the “[i]nterlocking international and domestic bargains, involving self-restraint and mutual restraint [that] buttress East Asia’s stability and cooperation” (17). Second, in so doing, Chan asserts that in East Asia, cooperative aspects of regional interactions have been at least equally – if not more – dominant than power competitive elements; and that credible commitments to self- and mutual restraint – both in formal contexts such as treaties and regional institutions, as well as informal exchanges such as significant trade and investment – are more important dynamics than power balancing. Particularly useful is Chan’s interpretation of burgeoning strategic and systemic economic interdependence in the region – Taiwan’s significant investment in the mainland; the long-term trade investments between China and all of its neighbours, including Japan and South Korea; China’s accumulation of massive amounts of U.S. debt – as vital forms of “hostage giving” and “hostage taking,” signalling credible commitments to regional peace and stability precisely because of the “voluntary submission to costly penalties should bilateral relations deteriorate” (212). Third, in busting the power-balancing myth, Chan also exposes the myopia of the U.S. focus on counter-veiling growing Chinese geo-political power – as he puts it, this “singular focus on balance of power… reflects American ambitions and obsessions more than it does Asian reality” (5). This book strongly suggests that the transformative changes which China’s rise has engendered are in the economic realm, and that these trends have also helped to undermine fundamentally the post-war U.S. bargain with key East Asian states. Because these states do not perceive China as a shared external threat, their demand for U.S. security guarantees has diminished, alongside their reduced dependence upon the U.S. market and economy as they re-orientate towards the Chinese economy. The upshot of Chan’s thesis is that the U.S. needs to focus on fixing these dissolving interlocking bargains in more sustainable ways beyond invoking the China threat. 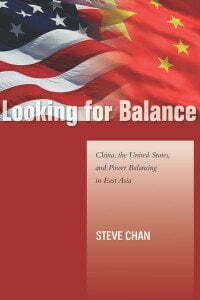 Looking for Balance is a significant contribution to the International Relations and East Asian security literatures because Chan works outside the tired IR mainstream in drawing upon disparate strands in existing scholarly research, ranging from classical realist and liberal interdependence, to political economy and the growing body of research into historical East Asian international relations. The book also helps to rebalance the field by focusing on the choices and agency of other East Asian states, as opposed to confining itself solely t to China and the United States. Most importantly, Chan advances the state-of-the-art investigation by demonstrating how we may ask other, more useful, research questions in our quest to understand contemporary transformations in the international order. To begin with, this book reminds those interested in U.S.-China relations that the most useful research puzzles tend to be based on empirical observations rather than expectations derived from theories developed within other contingent national and historical contexts. By showing convincingly the serious limitations even of central IR concepts like balance of power and power balancing in and of themselves, Chan adds his weight to other scholars who have been trying to haul realism away from its social science pretensions back towards its classical roots. Understanding the complexities and dualities of international life requires contingent, agentic, and interactive theories rather than over-simplified, zero-sum material-structural models. This book is not an easy read compared to many of its realist or liberal counterparts precisely because Chan eschews the linear narrative in favour of an eclectic survey of various fields as well as historical and contemporary examples to substantiate his theoretical arguments. But this enterprise is particularly useful because Chan is not alone. His argument that great powers are concerned as much about assurance as competition, his focus on reciprocal commitments and restraints, and his conviction that states more often act to defuse and tame asymmetrical power rather than trying to balance or contain it – all these reflect and reinforce a growing alternative body of works on East Asian international relations. On the one hand is the community of scholars who have revealed how much the social foundations and dynamics of East Asian international orders throughout history have departed from those set out in Euro- and U.S.-centric IR theories. Centred on similar questions of assurance, restraint and reciprocity that Chan highlights, these studies of classical Sino-centric orders have particularly elucidated the alternative social bargains and relationships specific to hierarchal authority relationships and the in-group/out-group dynamics that characterised the region’s experience. On the other hand, the trajectory of Chan’s thesis may have a putative theoretical home: the ‘English School’ approach to IR has traditionally dealt with both the conflictual and cooperation aspects of what Hedley Bull called the anarchical international society; and recent scholarship has emphasized the centrality of both taming as well as justifying unequal power and authority, as well as the fundamental challenges of how to reconcile the type of clashing beliefs and worldviews that Chan suggests we face in between American interpretations and the Asian reality. My own work, detailing the post-Cold War re-negotiation of the social compact under-girding what I see as a U.S.-led hierarchical order in East Asia that incorporates China, conceptually develops and empirically analyses many of Chan’s broad themes in Looking for Balance. Additionally, scholars of East Asian IR working out of the English School tradition have recently attempted to flesh out how and to what extent East Asian international society diverges from and challenges global and other regional international societies. These works point to important research paths which those scholars sympathetic to Chan’s rallying cry can explore further. Indeed, the chief contribution of Looking for Balance lies in how Chan’s efforts point to exciting new research agendas in East Asian security and international relations. In striving to convince his primary American IR audience to step outside the standard realist-versus-liberal theoretical straight-jacket, Chan mainly concentrates on setting out his conceptual stall in this book. He makes the argument that balancing is not occurring in East Asia, and then innovatively theorizes why this is the case. But this book does not actually test this theory against the empirical realities in the region, leaving the task to others. This task promises to be a fruitful one. The key further research challenge arising from this book is how to study the dogs that Chan identifies as not barking, and how to test his theories about why they do not bark. Chan’s arguments are complex and present many tantalizing hypotheses that might be tested in East Asia – for example, that the interlocking defense industries that span liberal democracies provide a “strong guarantee” that they are unlikely to go to war against each other; and that the interlocking economic networks have “the effect of committing the relevant countries to cooperation” (133). Certainly, a prominent area of future research lies in more clearly fleshing out through empirical study the economic-security nexus. To begin with, how can we test Chan’s thesis about credible commitments in the form of economic ‘hostage giving’ through significant investments and foreign reserve buying? Do Chinese decision-makers see that they are giving themselves as hostages to U.S. economic and political fortunes through their massive purchases of U.S. debt, and do Taiwanese leaders understand their economic investments on the mainland in the same way? How about Japanese economic ties with China? Do these decision-makers opt for choices that demonstrate these constraints at key junctures? Is there variation in how this credible commitment variable operates across cases, and why? How would we deal with the disparate domestic interest groups in these polities that make economic as opposed to security policies; and how would we attribute common strands of strategic thinking? Within the domestic realms, how does Chan’s ‘economic development-regime legitimacy’ linkage work in practice? Further research along these lines will help significantly to substantiate Chan’s efforts to study the currently under-rated puzzle of why there is such a stark apparent division between economic and security thinking and practice in the region. Chan’s unifying theme of credible commitment will also bear more development and testing. For instance, he portrays the Japan-U.S. security relationship as a form of lasting credible commitment by the U.S. to restraining its ally. But the contemporary problem may be precisely that the post-war bargain between the U.S. and China on Japan – that the U.S. would keep Japan down using the alliance and thus hold the ring between China and Japan — is breaking down because Beijing has come to view the revisions to the scope and domain of Tokyo’s defence responsibilities within the alliance as evidence that the U.S. is facilitating Japan’s remilitarization. In other words, a vital part of the interlocking bargains Chan outlines may have already started unravelling, despite the “stasis” that he broadly sees through the persistence of key U.S. alliances (130-1). This then leads to the wider question: under what conditions do these bargains become unstable, and what happens when they do? I have argued elsewhere that East Asia has undergone an ‘order transition’ rather than a power transition precisely because the related series of social compacts between the U.S., China and region states have been continually renegotiated since the end of the Cold War, in spite of the dogs of war not yet having barked. Those wishing to employ Chan’s framework should delve deeper into the connections between the domestic and regional/international dimensions of these evolving interlocking bargains. Into the twenty-first century, one of the hottest topics in the international relations (IR) field is China’s rise and its global ramifications, as well as its meaning for U.S. policies toward China and East Asia. Hence the debate on whether to contain China or engage with it, and whether China’s neighbors will incline to balance against it. By marrying IR theories with regional studies, Steve Chan’s Looking for Balance challenges the prevailing theories of balance of power, which have dominated our understandings with regard to the power shift in East Asia as a result of China’s rapid rise. Based on an exhaustive review of the pertinent literature on balance of power, Chan’s book not only identifies the points of tension in the balance-of-power dynamics in interstate interactions, it also focuses on “the dog that did not bark,” (2) i.e. the historical cases of nonoccurrence of balance of power that have so far been ignored. This lays the foundation for Chan to challenge contemporary applications of the balance of power theories in East Asia regional studies against the background of China’s rise. Based on empirical data, Chan makes two important arguments: first, in a unipolar post-cold-war world, the invocation of balance of power is often used to justify policies that have the intent and effect of sustaining and increasing U.S. military preponderance; that is to sustain the imbalance in favor of the U.S., rather than balancing the asymmetry or potential asymmetry between China and the U.S. as a result of China’s rise. Second, China’s neighbors have not engaged in armament and alignment, typical behavior of a policy of balance of power against China, which is the rising power that may upset the regional status quo. Why did the dog not bark? Chan’s answer is simple: the ability of the powers in the region to communicate a credible commitment to honor agreements and to eschew opportunistic behavior, and he considers commercial and financial ties among East Asian nations as a form of credible commitment. Thus, collaboration, cooperation, and integration could prevail in the region, while the probability of militarized conflict would be reduced. Chan’s optimistic view on the current and future East Asian security environment derives from his conviction that the elites in the region have come to a realization that the pursuit of balance of power would entail a heavy cost that not only includes the cost of competitive armament but also the loss of commercial gains in doing business with one another, what Chan calls “opportunity cost” (3). Thus, economic performance took priority over military buildup in the regional politics. To drive the point home, Chan states that “Credible commitment is a distinct, unifying idea for my argument,” and further emphasizes that “interlocking international and domestic bargains, involving self-restraint and mutual restraint, buttress East Asia’s regional stability and cooperation” (16-17). Chan argues that the elite in China and its neighboring countries consider economic performance as the foundation of regime legitimacy, which explains why they prefer commercial gains to military buildup in conducting interstate affairs. For them, their policies address “international and domestic bargains” at once. In other words, credible commitment is based on the self-interest of all parties concerned, thus, it can sustain regional stability and cooperation in the long run. This is why Chan pays particular attention to “the intersection of politics, economics, and security considerations” (13). Chan’s argument seems to be convincing if one examines Beijing’s changing strategy in dealing with Taiwan’s independence movement. Beijing’s early hard-nosed policy of threatening use of force backfired badly; the Clinton Administration sent U.S. naval forces into the area, while the strength of the independence movement in Taiwan was enhanced by the Beijing’s military threat. Beijing quickly learned its lesson. While the Democratic Progressive Party (DPP) government in Taiwan did not discourage commercial activities with the mainland, Beijing continued to encourage business development between both sides of the Taiwan straits. This commercial strategy yielded impressive political dividends for Beijing: hundreds of thousands of Taiwanese citizens living and doing business in mainland organized a ‘go-home-to-vote’ campaign to defeat the DPP candidates who were in favor of independence from China. Likewise, the Chinese purchase of a huge amount of U.S. government bonds and substantial investment by the United States in China created a scenario of “mutual hostage taking and hostage giving” (6), as Chan interestingly puts it, that effectively reduced the probability of armed conflict between the two nations. If Chan’s argument is sufficiently convincing in explaining the reality in East Asia during the past twenty years, I am not convinced that it can be used to predict what would happen there in the next twenty years. I would like to paraphrase the German philosopher Karl Marx as well: theory is always pale, while the tree of real life is evergreen. In a longer historical perspective, no theory is sufficient to predict future occurrence in a country, let along in a region as complex as East Asia. There are simply too many variables and unforeseen undercurrents for anyone to possess a ‘crystal ball’ for foretelling future developments. China’s recent economic growth is not the first ‘economic miracle’ in the region; Japan’s postwar rapid and sustained economic growth proceeded China’s. Japan became such an economic superpower that some Americans feared that Japan would overtake the U.S., especially when Japanese firms purchased U.S. landmark buildings such as the Rockefeller Building in Manhattan in the 1970s and 80s. But that kind of worry vanished when the Japanese economic ‘miracle’ suddenly ceased to work in the 1990s, followed by the prolonged deflation and stagnation that has lasted to this day. It is still to be seen if the current ‘Abenomics’ of Prime Minister Shinzō Abe will revive the Japanese economy. Why should anyone believe that the Chinese economic ‘miracle’ will last forever? In fact, since Chan completed this book in 2009, there have been plenty of signs that definitively suggest a slow-down in China’s economic growth. The question for the Wall Street is whether it will be a ‘hard landing’ or a ‘soft landing.’ The concerns over China’s ‘real estate bubble,’ high debt-to-GDP ratio, the population-aging problem (i.e. the ‘demographic time bomb’) and their effect on China’s economic future are permeating the discussion among academics and policymakers alike. If economic performance is the linchpin to regime legitimacy and international cooperation via credible commitment, how the Beijing elite act when the economic boom turned into bust? Would Beijing’s ‘regime strategy’ remain the same as it was before 2009? No theory can answer this trillion-dollar question, but a historical reference in the region may give us some hint. Tokyo’s foreign policy in the interwar period experienced a drastic change from a cooperative one to a militarist one, with the Great Depression as the demarcation line. The Japanese elites were hopelessly divided, some were seduced by the rising ultra-nationalism for their own political gain, and the ‘men of high purpose’ started to take over power at home and to lead the nation into a ruinous war. The recent Bo Xilai Affair in the Chinese political theater reminded us of the factional fracture of the Chinese elite, some of whom are more hawkish and nationalistic than others. If a Chinese economic downturn leads to a political legitimacy crisis for the Beijing elite, would Chan’s rosy picture continue to hold true? A brief look at what happened since 2009 would make one worry: China’s relations with Japan and its neighbors in the South China Sea have deteriorated over disputed territorial claims, and Japan in 2013 increased its defense budget for the first time in 11 years to boost its Coast Guard in response in particular to China’s frequent incursion into the disputed waters. In turn, Beijing increased its military budget in 2014 by 12.2%. These developments are simply not going in the direction that Chan predicted. I am very grateful to Evelyn Goh and Michael Sheng for their comments on my book, Looking for Balance. Their comments are fair, constructive, and insightful. It is also gratifying that we agree on many issues. Readers of this roundtable will therefore not encounter the sort of adversarial exchange that sometimes characterizes such occasions. I attend here to one area where the two reviewers’ reactions tend to converge. They both invite and recommend greater attention to validation. How does one know that the claims of another are worthy of acceptance? Empirical testing – especially by means of falsifiable prediction – is necessary and even essential in the scientific enterprise. History – how events unfold in accordance with or contradiction to one’s expectations – should be the ultimate arbiter of the validity of different perspectives and arguments (while duly recognizing that correct predictions may still be based on faulty logic or mistaken premise). I therefore agree with Goh that various claims advanced in my book should be formulated as explicit propositions to be investigated at the micro or macro level (such as by means of survey data about the political attitudes of different age cohorts, interviews and documentary analyses seeking to discern officials’ policy priorities, and aggregate analyses studying the statistical association between commercial integration and conflict abatement). Although, as Sheng remarks, the future is inherently difficult to predict, we can nevertheless offer some general prognoses about broad patterns (such as whether commercial integration and democratization characterize the overall trend of regional change, and whether they are likely to have a positive impact on the political economies and security relations of countries in the Asia Pacific region). Social scientists’ prognoses are contingent forecasts – they are subject to human intervention (indeed, the very purpose of some forecasts, such as a warning of an impending attack, is to call for action so that this event may be nullified). As I argue in my book, self-fulfilling and self-denying prophecies are an inherent part of the phenomenon we study (as an obvious example of self-fulfilling prophecy, when one undertakes balancing policies against another state, this counterpart will feel threatened and respond in kind, thus initiating and perpetuating a vicious cycle of acrimonious actions and reactions). Comments from both readers also suggest their agreement with my premise that foreign relations are never unilateral matters and only rarely strictly bilateral concerns. Thus, an analytic focus solely on Beijing will be disappointing because the other party involved will also have a say in determining the evolution of their relationship. Moreover, some third parties will have a significant influence on this relationship. Sheng and I are in agreement that the U.S. plays such a role in the Asia Pacific. It is the proverbial elephant in the room. Were it not for its role, one would be hard pressed to explain the protracted impasse – the so-called enduring rivalries – involving China and its neighbors (or among its neighbors). Most of these being highly asymmetric (lopsided) contests, the weaker side (e.g., Taiwan in cross-Strait relations, North Korea vis-a-vis South Korea, South Vietnam vis-à-vis North Vietnam, Pakistan in contesting with India) would not have persisted in holding out against the stronger side, nor would the stronger side be restrained from imposing a unilateral (and if necessary, armed) settlement were it not for the expectation that a powerful outsider would intervene to assist the weaker side. This expectation in turn yields a proposition that can be confirmed or rejected by future events: ceteris paribus, if a powerful third-party sponsor or patron’s commitment (such as the U.S. for Taiwan, and China for North Korea) to defend the weaker disputant becomes more doubtful, the prospects for a settlement should improve. Note that this hypothesis is stated in probabilistic terms. Isolated cases that contract it may very well be disappointing but not fatal. But when evidence based on a large sample from many different countries and times produces a contrary pattern, this phenomenon will be devastating. The above hypothesis illustrates what I have in mind when I referred to contingent outcomes. What A does depends on what B, C, and other actors do. Thus, A’s action is not preordained. Note also the caveat ceteris paribus (assuming all else being equal). The reality of international relations can hardly be reduced to simple bivariate statements such as if X, then Y. One can readily imagine intervening variables that can alter A’s reaction to its ally’s reduced level of support. It is one thing, for example, for Taipei to perceive a slackening of Washington’s commitment to its defense, and quite another for Tokyo to do so. Moreover, and as Goh insightfully points out, the pertinent dynamics reflect not only Tokyo’s perception of Washington’s commitment, but also Beijing’s perception of Tokyo’s perception and the latter’s likely action stemming from this perception. Ongoing U.S. fiscal challenges may very well force Washington to trim its defense commitment to Tokyo and encourage the latter to enhance its own military capabilities, thus signaling to Beijing the unravelling of prior explicit pacts or implicit commitments that have thus far restrained the prospects of reviving Japanese militarism. In this scenario, a reduction in the U.S. commitment to the defense of Japan can actually bolster Tokyo’s remilitarization and, contrary to the above hypothesis, promote an intensification of Sino-Japanese rivalry. It may therefore be useful to introduce a third, intervening variable to the above formulation, one that focuses on the balance of capabilities between the two direct parties. When their relationship is characterized by relative balance (such as in the case of Japan and China), a reduction in or withdrawal of third-party support for the weaker side may very well have the effect of stimulating an intensification of rivalry. Conversely, when there is a huge imbalance (such as across the Taiwan Strait or on the Korean peninsula), this action by a foreign patron or ally (such as China for North Korea, and the U.S. for Taiwan) will have the opposite effect of hastening a resolution of the conflict between the two immediate contestants. There is a corollary to the above line of reasoning. When a country refrains from ramping up its military expenditures as much as it could have afforded, this behavior represents a vote of confidence in its ally coming to its defense. This behavior communicates its willingness to in effect ‘subcontract’ to or rely on this ally for its own defense. The obverse of this hypothesis is that when this ally is perceived to have become less reliable, one should see the pertinent country increasing its own defense capabilities (such as North Korea’s pursuit of nuclear weapons in view of reduced support from Beijing and Moscow). Parenthetically, if Washington alters its heretofore strategic posture of forward deployment of its armed forces in the Asia Pacific to assume the stance of an offshore balancer, this change will communicate a fundamental revision of its commitment to the alliance network it has established since 1945. Naturally, why the U.S. has thus far pursued the former approach (in contrast to, say, the traditional British policy toward continental Europe) is itself a puzzle that realism has yet to confront. Space limitations do not permit me to offer a more extended discussion on future research that can be profitably pursued to confirm or refute the arguments advanced in my book. I will end by suggesting that a high level of economic interdependence serves as a bulwark (built on the basis of interconnected transnational interests) against the danger of backsliding to confrontations reminiscent of the Cold-War days. My empirical claims are about comparisons – such as the current situation prevailing in the Asia Pacific relative to its own past and relative to other regions such as the Middle East (which, as my book has argued, started from circumstances rather similar to East Asia’s in the 1950s). One may also entertain some counterfactual reasoning: how would the ongoing contested sovereignty in the East and South China Seas have evolved had there not been the dense trade and investment ties connecting the disputing countries? One could very well imagine a much more combustible set of circumstances in the absence of such ties. Indeed, it is even possible to conjecture that precisely because the pertinent elites have become more optimistic about their ability to manage these disputes and confident about keeping these disputes from spiraling out of control that they are now more willing to quarrel loudly, albeit in carefully choreographed clashes. Whether or not the existing ties of economic interdependence are, during a time of economic distress, sufficiently robust to resist nationalist impulses of beggar-my-neighbor policies, which are reminiscent of the protectionism practiced by the major economies in the Great Depression, is of course an empirical question. Judging from events since the ‘great recession’ of 2008 and China’s economic slowdown, I would say that the Asia Pacific region has fared rather well compared to Latin America and even Europe. So I see the glass being more than half full. David C. Kang, “Getting Asia Wrong: The Need for New Analytical Frameworks,” International Security, Vol. 27, No. 4 (Spring 2003), 57-85. Steve Chan, China, the United States and Power Transition Theory: A Critique (London: Routledge, 2008). Chan cites most of these other works, including William Wohlforth et al, “Testing Balance-of-Power Theory in World History,” European Journal of International Relations 13:2, 2007, 155-85; Randall Schweller, Unanswered Threats: A Neoclassical Realist Theory of Underbalancing (Princeton: Princeton University Press, 2004); Jeffrey Legro, “Purpose Transitions: China’s Rise and the American Response,” in Robert Ross and Zhu Feng, eds., China’s Ascent: Power, Security, and the Future of International Politics (Ithaca: Cornell University Press, 2008), 163-87. See especially David Kang, “International Relations Theory and East Asian History,” Journal of East Asian Studies 13:3, May-August 2013, 181-205 (and related articles in this special issue); Shogo Suzuki, Civilisation and Empire: China and Japan’s Encounter with European International Society (London: Routledge, 2009); Yuen Foong Khong, “The American Tributary System,” Chinese Journal of International Politics 6:1, Spring 2013, 1-47. Hedley Bull, The Anarchical Society: A Study of Order in World Politics (London: Macmillan, 1977); Andrew Hurrell, On Global Order: Power, Values, and the Constitution of International Society (Oxford: Oxford University Press, 2007). Evelyn Goh, The Struggle for Order: Hegemony, Hierarchy, and Transformation in Post-Cold War East Asia (Oxford: Oxford University Press, 2013). Barry Buzan and Zhang Yongjin, eds., Contesting International Society in East Asia (Cambridge: Cambridge University Press, forthcoming 2014. Evelyn Goh, “East Asia as Regional International Society: The Problem of Great Power Management,” in Barry Buzan and Zhang Yongjin, eds., Contesting International Society in East Asia (Cambridge: Cambridge University Press, forthcoming 2014). Bo Xilai was a leading Chinese Communist Party official who was arrested, convicted of corruption in September 2013, and sentenced to life imprisonment. Joyce and Gabriel Kolko, The Limits of Power: the World and United States Foreign Policy, 1945-1954 (New York: Harper & Row, 1972).